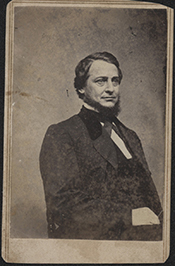 VALLANDIGHAM, Clement Laird, (uncle of John A. McMahon), a Representative from Ohio; born in New Lisbon, Columbiana County, Ohio, July 29, 1820; attended a classical school conducted by his father and Jefferson College, Canonsburg, Pa.; moved to Maryland and for two years was a preceptor in Union Academy at Snow Hill; moved to New Lisbon, Ohio, in 1840; studied law; was admitted to the bar in 1842 and commenced practice in Dayton, Ohio; member of the State house of representatives in 1845 and 1846; edited the Western Empire 1847-1849; was an unsuccessful candidate for election in 1852 to the Thirty-third Congress and in 1854 to the Thirty-fourth Congress; delegate to the Democratic National Convention in 1856, 1864, and 1868; successfully contested as a Democrat the election of Lewis D. Campbell to the Thirty-fifth Congress; reelected to the Thirty-sixth and Thirty-seventh Congresses and served from May 25, 1858, to March 3, 1863; unsuccessful candidate for reelection in 1862 to the Thirty-eighth Congress; arrested by the Union military authorities in 1863 for treasonable utterance and banished to the Confederate States; went from Wilmington, N.C., to Bermuda and thence to Canada, where he remained until June 1864; during his exile was an unsuccessful Democratic candidate for Governor of Ohio in 1863; unsuccessful candidate for election to the United States House of Representatives in 1868; died in Lebanon, Ohio, June 17, 1871; interment in Woodland Cemetery, Dayton, Ohio. Klement, Frank L. The Limits of Dissent: Clement L. Vallandigham and the Civil War. New York: J. Walter & Co., 1864. Reprint, Lexington: University Press of Kentucky, 1970.